Additional "spy" photos of the alleged PSP-3000 hardware update that we posted last night have come to our attention, again courtesy of the PSPChina.net message board. These shots show off what appears to be a working prototype of the PlayStation Portable, said to have built-in microphone support, among other alleged new functionality. 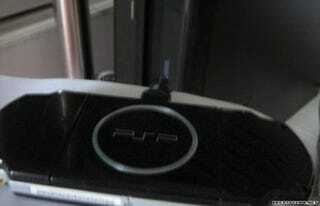 Hit the jump for exciting photos of the new thinner PSP ring, another look at the PS button and one more cosmetic change. While you do say, chant "This is a rumor, this is a rumor." Yes, that's that thinner ring. Again. It's thinner. This shot of the PS button, the one that supposedly replaces the Home button on the current PSP model, looks noticeably different from what we saw previously. It looks more like the PS button on the SIXAXIS controller and is therefore, more suspect. That would be some handy iconography stamped on the bottom of the PSP-3000. Answers the question, "What am I sticking these cables in here for?"